I guess, I should have called this week as "ice cream week" on the blog! 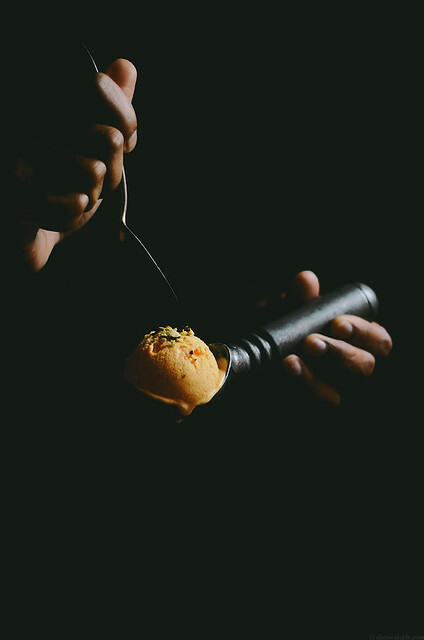 First the beet one and now this bright orange carrot ice cream. As of now, my freezer looks like a haven of several brightly colored containers, one would think I'm stocking up for an emergency. But with the warmer temperatures sinking in, I think this stockpile will be treasured well. If you've eaten at an Indian restaurant you might have seen "gajjar ka halwa" (Hindi) or carrot halva on the menu. Traditionally, the halva is prepared by cooking shredded carrots in evaporated milk, ghee and sugar and then flavoring it with saffron and cardamom. After cooking, fried raisins and nuts are added as a garnish. (I've shared a lighter version of this dessert here, previously). Now here's the frozen version of this popular dessert that's just as flavorful and tasty! When I set out to make the ice cream version of this halva, I had one big obstacle to overcome, carrots are acidic by their very inherent nature and milk curdles in acid, this posed a problem. To avoid this, I first infused the milk and cream with saffron and cardamom and then prepared the base. Once everything was chilled, I folded in the carrot purée and then poured the entire liquid into my ice cream maker. 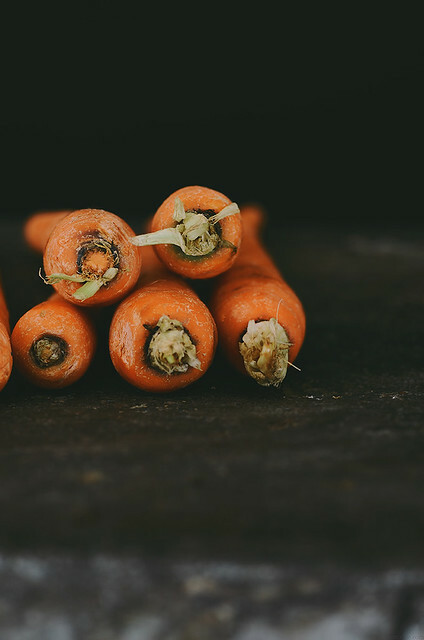 The cornstarch helps to hold the liquid together while adding the acidic carrots to the dairy at a low temperature prevented any potential curdling. Use the brightest and fresh carrots you can find for a robust flavor and vibrant color. Oven roast your carrots. Peel and wrap the carrots in aluminum foil and keep them in an oven at 400F for about 45 minutes to 1 hour until they are soft and tender. Transfer the carrots to a food processor and pulse until you get a smooth purée. 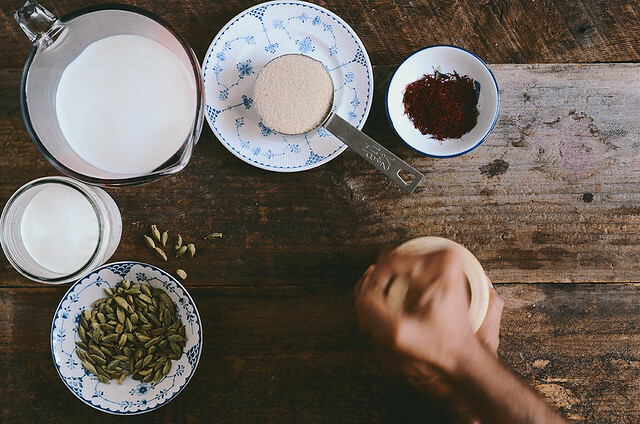 I remove the green cardamom pods once the milk is infused and done cooking. Some of the seeds did fall out from the pods but I like that. 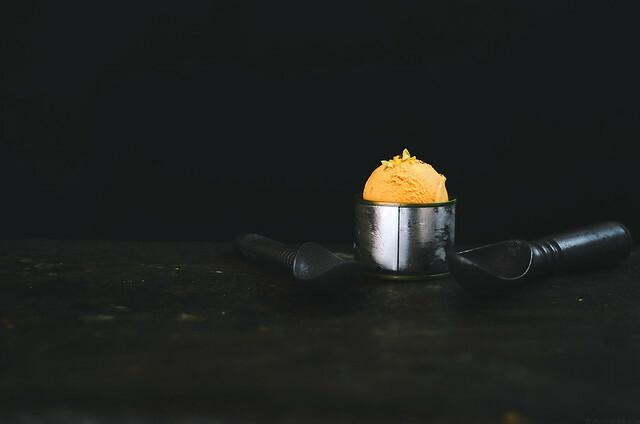 If you don't then strain the ice cream base but remember that you might lose a few saffron strands. Saffron can be expensive and you can go anywhere from a few strands to 1/4th of a teaspoon in this recipe. I leave this up to you. The carrots will impart their color but saffron also gives a unique flavor when added to dishes. 1. 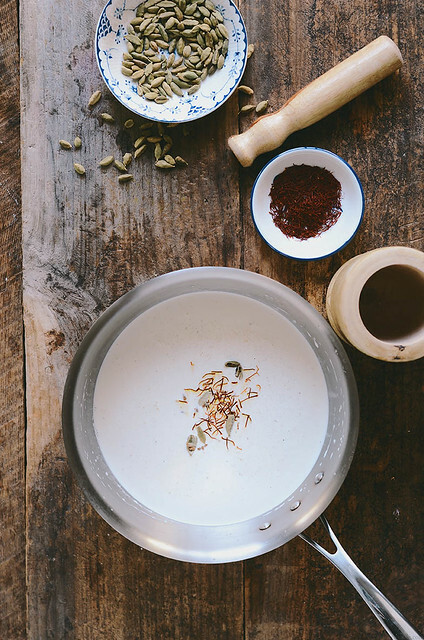 Place the milk, heavy cream, cardamom pods, saffron, and sugar in a thick bottomed saucepan and bring the contents to a rolling boil on medium-high heat. Stir occasionally to prevent the milk from burning. In the mean time, stir the cornstarch and 2 tablespoons of milk in a small bowl to form a slurry. 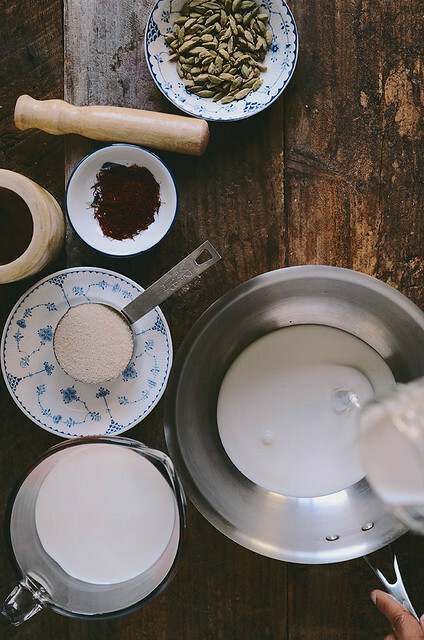 After the sugar is completely dissolved and the milk boiled for 1 minute, remove the pot from the stove and quickly whisk in the cornstarch. Return to stove and continue to boil and whisk for 2 minutes, the milk will begin to thicken and take on the consistency of a thick custard. Remove from stove and pour about 1/2 cup of this ice cream base into a large bowl containing the cream cheese. Whisk to combine until smooth, then add the rest of the ice cream base and combined until smooth. Allow the base to cool completely to room temperature. 2. Once the ice cream based has cooled to room temperature, remove and discard the green cardamom pods. If some of the cardamom seeds are left behind in the base, it is fine. You can also strain the entire ice cream base through a strainer if desired. 3. Transfer the contents into a 1 gallon ziptop bag and seal airtight. Place the bag in an ice cold water bath and cool to around 40F or until ice cold. 4. 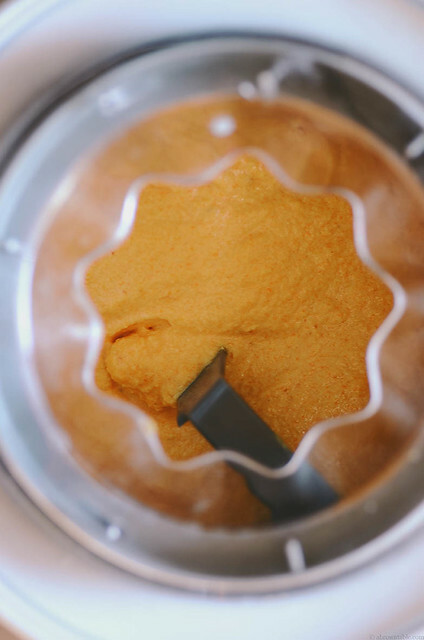 Fold the carrot purée into the chilled ice cream base and stir until combined. 5. Pour the ice cream base into the prefrozen canister of your ice cream maker and churn as per the manufacturer's instructions. (I normally churn for 30 minutes until the ice cream resembles a soft-serve consistency). Transfer the ice cream base into a freezer-safe container, sprinkle and fold in the pistachios and layer the surface of the ice cream with parchment paper. Press gently to remove any air bubbles and seal the container with the lid. Freeze for at least 4 hours until the ice cream is firm before serving.